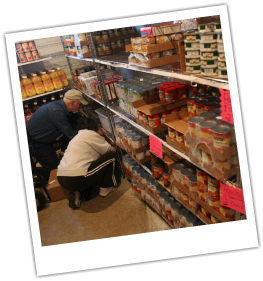 Our pantry offers clients in need emergency food for three meals a day for three days. We believe in empowering the people we serve by offering them choices about the assistance they accept. Clients may choose from a variety of options from each of the five food groups to suite their needs. The amount of food from each food group offered increases for larger families. We recently completed a remodel of our pantry that allows us more frozen storage and a greater variety of food options for our clients. The pantry will be closed on all holidays. These closings will be posted a month in advance. 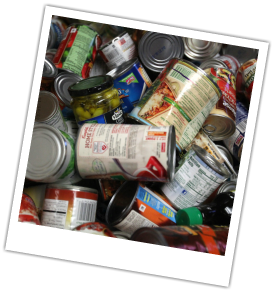 This is an emergency food assistance program: clients may only visit the pantry once per month. Unused visits cannot be rolled over. In the event of an emergency, please call first. Clients are asked to be polite and considerate to our volunteers. If you have questions or concerns, please ask our volunteers. They will be happy to clarify or correct any issue. Anyone found misrepresenting him or herself to the pantry, or any client who sells, trades or gives pantry food to people other than those residing in the client’s home could lose their eligibility for pantry use. Please let the volunteers know of any changes in household status. Once a year in July, all clients must provide up-to-date ID for adults living at the household address. Verification of children must also be provided, such as school records. As a partner of the Food Bank of Central New York, nutrition education and advocacy are built into our services. Our aim is to educate the community about solutions to the issue of hunger.